Don’t take it from me, Trump says. Look at all these other people saying there was no collusion with Russia. “Collusion,” in this case, isn’t a legal term pointing to a specific crime. Depending on the evidence, experts say, cooperating with another country to influence a U.S. election might be an offense such as conspiracy or taking illegal campaign contributions from foreign nationals. Special counsel Robert S. Mueller III is investigating “any links and/or coordination between the Russian government and individuals associated with the campaign of President Donald Trump,” but he hasn’t announced any conclusions. Reporters, meanwhile, have pieced together contacts between Russian individuals and Trump family members or campaign advisers. Mueller has revealed through numerous court filings “an elaborate Russian operation that injected chaos into a U.S. presidential election and tried to help Trump win the White House,” as the Associated Press reported. Trump has attacked the FBI’s investigation of such links from the start, even before Mueller was appointed. But it’s a more recent development to see Trump defending himself by quoting Sen. Richard Burr (R-N.C.), the chairman of the Senate Intelligence Committee, which is also investigating Russian interference. Trump also points to congressional testimony given in February by his former personal attorney Michael Cohen. On Friday, the president referenced comments from Kevin Downing, attorney for onetime Trump campaign chairman Paul Manafort, and from U.S. District Judge T.S. Ellis, who presided over one of Manafort’s trials and sentenced him to prison. Trump for months has been citing Rep. Devin Nunes (R-Calif.) and a report by the House Intelligence Committee, which Nunes formerly led. Except for Nunes, Trump is stretching what all of these people said. Russia hacked and strategically released Democrats’ emails in 2016 and spread propaganda to interfere in the U.S. presidential election, according to the U.S. intelligence community, the Justice Department, and the House and Senate intelligence committees. Russian President Vladimir Putin’s goal was to help Trump win, according to the U.S. intelligence community’s assessment from January 2017. Let’s look at the way Trump characterizes comments from Burr, Cohen, Downing, Ellis and Nunes, and what each of them actually said. The White House did not respond to a request for comment. On Feb. 12, Burr told reporters: “I’m not sure how to put it any clearer than I said it before. We have no factual evidence of collusion between the Trump campaign and Russia.” Then, asked whether his committee’s investigation exonerated Trump, Burr said: “Just saying what factually we’ve found to date. We haven’t finished our investigation.” A representative for Burr said the committee has not yet issued a final report. The vice chairman of the Senate Intelligence Committee, Sen. Mark R. Warner (D-Va.), has disputed Burr’s characterization of the evidence. Warner says that there’s circumstantial evidence of collusion and that some key players have not been interviewed by the committee. “Just in the public domain, there are literally reams and reams of evidence of Russian outreach to Trump officials and clear interest from Trump officials, including the president’s own son, welcoming the opportunity to get dirt on Hillary,” Warner said March 3 on CNN’s “State of the Union.” On NBC News’s “Meet the Press” the same day, Warner mentioned “the ongoing negotiations about Trump Tower [Moscow], well into the campaign,” “the dump of the WikiLeaks material,” “the president’s campaign manager sharing information, polling information, with the Russians,” and a meeting between Donald Trump Jr., Trump son-in-law Jared Kushner, Manafort and Russian lawyer Natalia Veselnitskaya at Trump Tower in New York. This is not quite what Downing and Ellis said. That’s a simple acknowledgment that Manafort was not tried on charges having to do with collusion in the 2016 election. Ellis was not stating “loudly and for the world to hear that there was NO COLLUSION with Russia,” as Trump claimed. This Manafort case centered on financial fraud — “hiding millions he made lobbying on behalf of Ukrainian politicians in overseas bank accounts, then falsifying his finances to get loans when his patrons lost power,” as The Post’s John Wagner reported. Downing told reporters outside the courthouse on Thursday that “there is absolutely no evidence Paul Manafort worked in collusion with any government official from Russia.” Again, this is a statement about Manafort in particular, not the Trump campaign in general, as the president’s comments suggest. Cohen spent hours accusing Trump of wrongdoing during a hearing of the House Oversight and Reform Committee on Feb. 27. But when the subject turned to Russia, Trump’s former fixer was circumspect. Nunes is a Trump supporter who has been saying “no collusion” since the summer of 2017, during the early days of various investigations. Trump is relaying Nunes’s remarks accurately. “Collusion” is a vague term, legally speaking. Setting legal questions aside, though, it’s impossible to ignore all the documented contacts between Trump’s campaign and Russians in 2016. Mueller’s investigation is still underway. He may have more information than Congress and the public, and he may reach conclusions as to whether the Trump campaign and the Russian government cooperated to influence the election. Our ruling is not about any legal questions, collusion or cooperation. It’s about the way Trump stretches comments from Burr, Cohen, Downing and Ellis to defend himself. Burr has said that he has not seen evidence of collusion between the Trump campaign and Russia, but Trump leaves out that Burr hedged by noting that the Senate Intelligence Committee has not finished its work. Cohen said that he didn’t witness any collusion but added that he would not necessarily have known about it and that he had “suspicions.” Downing said his client did not collude with Russians, but these comments are strictly about Manafort and do not extend to the entire Trump campaign. Ellis was not absolving Trump; he was describing Manafort’s case. 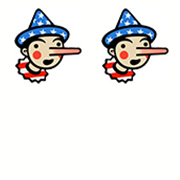 These significant omissions and exaggerations by Trump merit Two Pinocchios. "So, I just want to tell you that his [Paul Manafort's] lawyer went out of his way, actually, to make a statement last night: no collusion with Russia. There was absolutely none. The judge, I mean, for whatever reason — I was very honored by it — also made the statement that this had nothing to do with collusion with Russia." “[Michael Cohen] said no collusion. And I said, it’s funny, he lied about so many things, and yet he could have said — he might as well lie about that one, too. But he said no collusion. And everybody said no collusion. Richard Burr, Senator Burr, said no collusion. Senate Intelligence."